"If you want to destroy a department, you head it up with someone who is stupid." Making Rick Perry the Secretary of Energy, and Betsy (I don't know why everyone doesn't like me) DeVoss, Education Secretary are perfect examples. They're both pathetically stupid, and under-qualified. Perry didn't even know there was a Department of Energy when Trump appointed him to head it up. And DeVoss, who is against public schools and thinks charter schools are the way to go, is getting zero respect from school administrators and teachers. No wonder. She has absolutely no experience in school administration or teaching. Trump's nominee for the Agricultural post, Sam Clovis, had to withdraw recently, not because he had absolutely no credentials in science or agriculture, but because he got caught up in the Trump election campaign investigation. 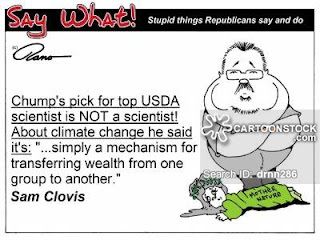 Otherwise, for the first time, instead of a top scientist in the field for the job, we would have had another idiot embedded in our government. None of Trump's appointees, or nominees, will ever pass the smell test, but that doesn't matter. They don't have to. As the backlog of nominees by Trump continues to grow, we can be sure his loyal minions are waiting for their big payoff. And, they all smell like week-old dead fish.